When scouting your house for the proper place for your bird’s new home, keep in mind that anywhere with a window is a prime spot for the avian environment. Not only will this give your pet a bird’s eye view of what’s happening outside, which will provide many hours of entertainment, but most birds don’t get enough natural light which helps them maintain healthy feathers and skin. If a window spot won’t work, you may need to get additional UV lighting to maintain your pet’s health. Buying a large enough cage to make your bird happy is going to impact your bird in a big way, so go for the biggest you can afford and have room for in your home. Large enough housing can be costly, it’s true, but this is a one-time expense that makes such a difference in your bird’s life, it’s worthwhile to shell out for. Cages should always be at least big enough for your bird to stretch his wings and ideally your bird should be able to make short flights from within the cage. Do some research on the breed of your bird before buying, as this will make a difference in the length and height you’ll need. For example, canaries do better in long cages that don’t need to be that high, while for parrots height is an absolute must due to the length of their tails, among other things. A bird’s tail should never brush the floor while sitting on their perch. Bars on your bird’s cage should be spaced close enough together that your bird won’t get his head stuck in the bars and have both horizontal and vertical bars for climbing and play. Avoid guillotine doors on cages as they have a tendency to fall shut and cause possible harm to your pet. A nice, roomy exit is what your pet desires and make sure you check the latches to ensure your bird can’t lockpick, some birds are highly talented in this regard! Remember that your bird will defecate while sitting on his perch quite frequently, so keep food and water dishes above the perch, never under it. A warm, comfortable, draft free environment is important for your pet, especially for tropical species. 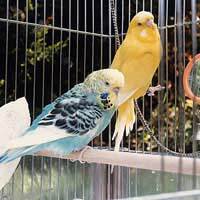 The cage should be situated away from air conditioners, heaters and other temperature control devices as drastic temperature changes aren’t healthy for your bird. Avoid putting cages close to the kitchen as many cooking implements have non-stick coating that are toxic to birds. It’s nice to put sprigs of greenery in your bird’s cage to chew on, but make sure they are safe for your pet. If you have other pets in the house, be sure the cage is out of their reach. And remember that your pet loves to gnaw, so be sure there is nothing in the cage that would be hazardous going down his maw. This means using untreated wood, uncoated wire and unpainted objects.